A matrix consists of a set of numbers arranged in rows and columns enclosed in brackets. The following diagram shows the rows and columns of a 3 by 2 matrix. Scroll down the page for more examples and solutions. 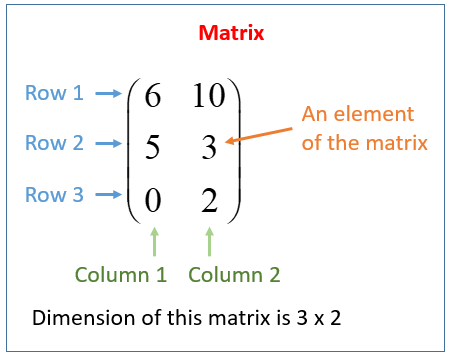 The dimensions or order of a matrix gives the number of rows followed by the number of columns in a matrix. The order of a matrix with 3 rows and 2 columns is 3 × 2 or 3 by 2. We usually denote a matrix by a capital letter. Each number in the array is called an entry or an element of the matrix. When we need to read out the elements of an array, we read it out row by row. Each element is defined by its position in the matrix. The basics of a matrix. Looking at rows, columns, elements and dimension. A matrix is a rectangular arrangement composed of row, columns and elements. The dimensions of the matrix are determined by the number of rows and columns. What are the dimensions of the matrix below? • The x-coordinates are the first row. • The y-coordinates are in the second row. • Each point is a column. What is the matrix for the following triangle? How to determine the dimension of a matrix and why it is important to be able to identify the dimensions of a matrix? A matrix is a rectangular arrangement or array of numbers often called eleents. The size or dimensions m × n of a matrix identifies how many rows and columns a specific matrix has. The number of rows is m and the number of columns is n.
1. The dimension of a matrix must be known to identify a specific element in the matrix. 2. To add matrices, the dimensions must be the same. 3. To multiply matrices the number of columns in the first matrix must be the same number of rows in the second matrix. How to state the dimensions of a matrix?